My little nephew had a big day today; it was his christening. I guess there was a lot more work for his parents but the boy had a lot of people to meet and greet as well as putting up with a complete stranger put water on his head. He did so well though, the little guy. We were asked to not take any photos during the ceremony but I had to risk it and shoot one anyway. I know, daring to defy the priest in church, where will that get me? Heh! I'm not sure they get how important it is to document what actually happens rather than just posing after the fact. Anyway, I am glad I did because I just love this photo (even if it's a bit unfocused and blurry due to me trying to sneak the shot in). 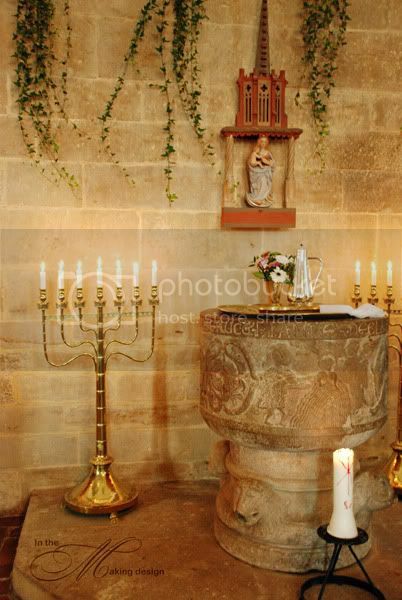 I just have to show the beautiful setting for the fountain in the curch. I love the stone wall in the background. Hi Linda! Agree wholeheartedly that it IS important to document what happens. This is such a special occasion and one that deserves to be documented. I am a priest who loves doing baptisms and I never ever stop family and friends from taking photographs BECAUSE I encourage the parents, each year on the baptism anniversary, to light the baptismal candle, get out the photographs, and tell the story of that day to the little one who will have no memory of the wonder of that day. These photos reveal a beautiful old church. 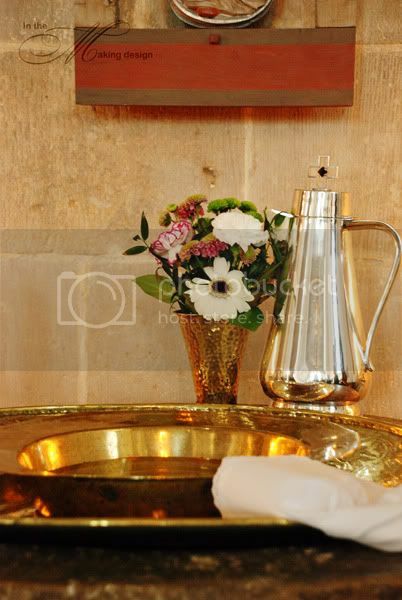 Mine is modern but baptisms are my favourite of all the sacraments. I have one this Sunday - 27th, for a precious little girl in our congregation. Blessings to you for sneaking the pic! Well thank you Jo-Anne! I wish they would see it the same way here. I've been to countless weddings and christenings where they forbid photography and it always saddens me. I would have taken the photo too. I think it's so important to document the moment. Maybe they didn't want everyone taking photos. I probably wouldn't either because it would take away from the ceremony but I would probably have at least one person designated at the photographer for the event. Beautiful photos!! I am so thankful that you were able to get some.